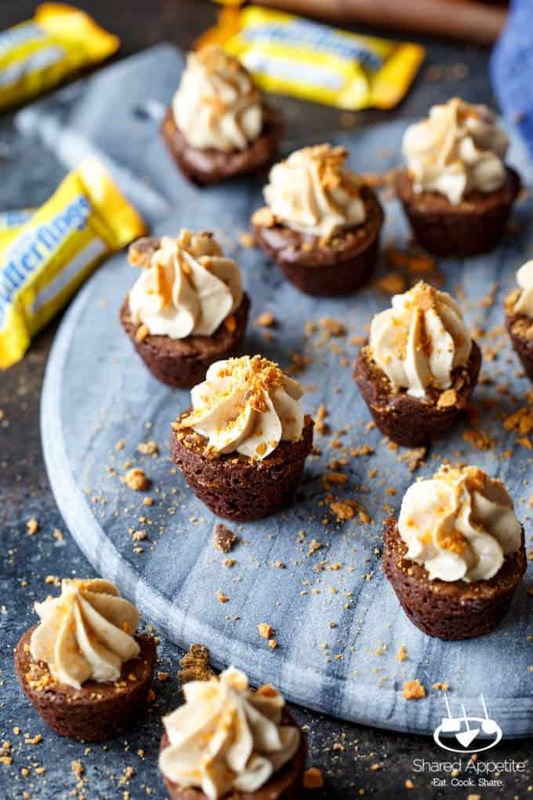 These Butterfinger Cheesecake Brownie Bites are brought to you byButterfinger®. As always, all opinions and recipe are my own. Thanks for supporting the brands that support Shared Appetite! Parents. You all can relate. Weekends are no longer about Asheley or I. Those times are long gone. Spontaneous days to the city to explore or lingering sunny days at the north fork vineyards have been replaced with… play dates. I’m not going to lie. I miss being able to just pick up and go on an adventure every now and again, but in complete honesty, I cannot imagine life without our sweet little Olivia. She’s at the perfect age right now… running around nonstop, talking up a storm, super inquisitive, and pretty much the cutest little kid on the face of this planet. As much as Asheley and I would love to selfishly keep Olivia all to ourselves, we know it’s kinda sorta important for her to be social and learn how to be around other kids. Thankfully, some of our great friends also have kids right around Olivia’s age. Play dates allows us parents to have some much needed adult time as well, where we can have conversations about adult things. Actually, that’s a lie. We just talk about our kids the whole time. Any successful play date revolves around one very important thing… the kids food. Ah, sweet nectar of life. There is nothing better than enjoying a meal with friends. Although a meal during play dates is more of a pick-and-grab-a-bite-when-you-can sort of mentality. We’ve learned over the months that food requiring sitting down or utensils is probably not the best way to go. 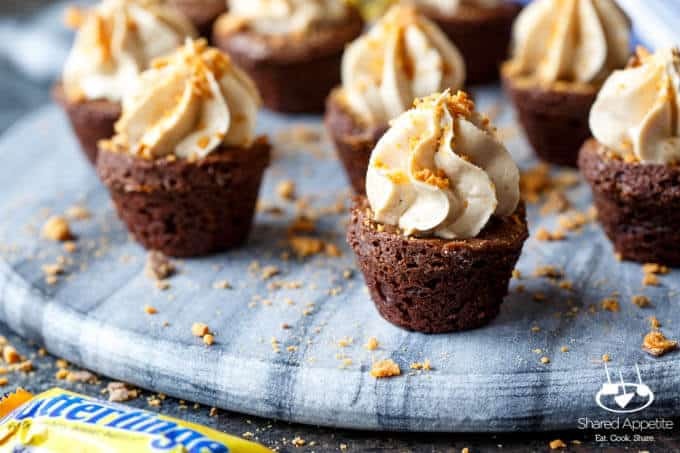 That’s why these Butterfinger Cheesecake Brownie Bites are the perfect dessert. They are completely make ahead, require no utensils, and can be eaten on the go (i.e. running after your kid who just put a rock in her mouth). Promise not to judge me? Or at least pretend like you’re not and then talk about me later behind my back? Okay, cool. I used to loathe the chocolate and peanut butter flavor combination. I didn’t understand why people would ruin a perfectly fine chocolate experience with something that was better left with some jelly on bread. 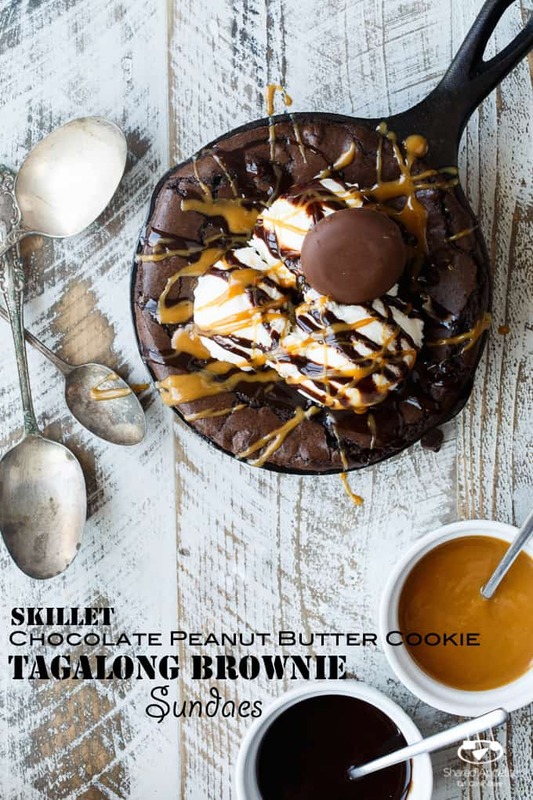 A few years ago that all changed, and my path to chocolate peanut butter enlightenment has grown exponentially (I’m looking at you chocolate peanut butter swirl cookies, vegan chocolate peanut butter mousse, chocolate peanut butter trifles, and skillet chocolate peanut butter brownie sundaes). But still, I can’t help but feel I’ve missed out on an integral number of chocolate peanut butter concoctions over the years. If only I knew then what I know now! Take candy bars, for instance. Growing up, I used to trade anything that had peanut butter in them for something else. Something with chocolate and crunch… that’s my favorite combo. But now, I want it all. 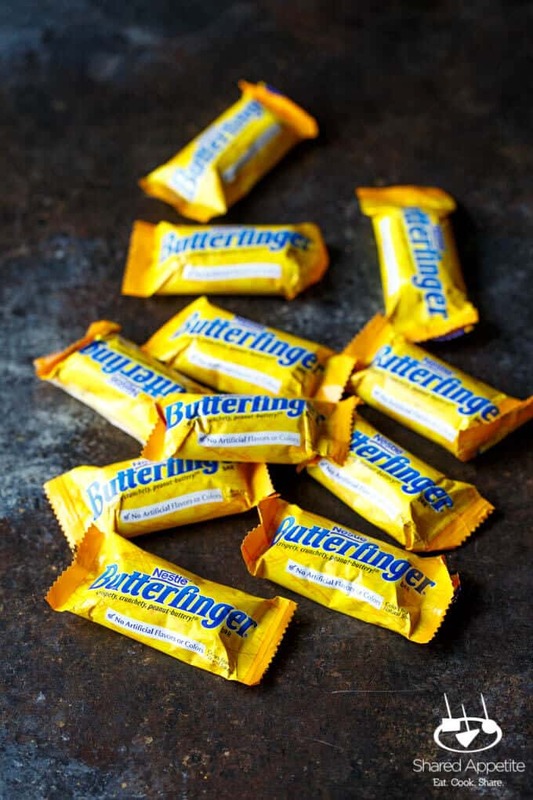 Behold, the Butterfinger® candy bar. 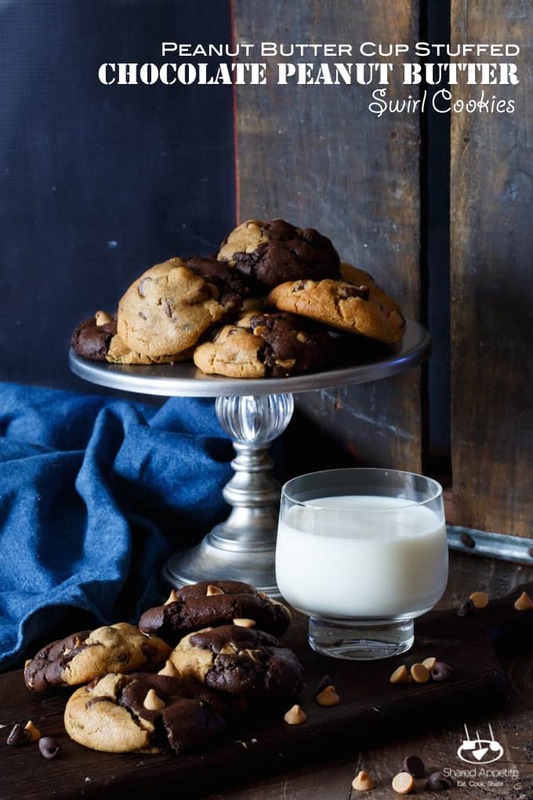 It has a chocolately, crispety, crunchety, and peanut-buttery taste and texture. 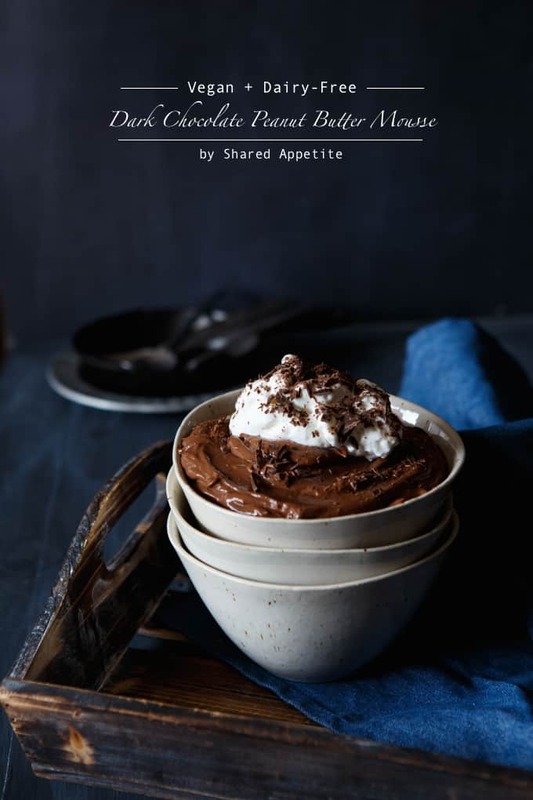 I wanted to capture all of that chocolate and peanut butter crunchy goodness in a handheld dessert… one that we could all eat “on the go” (i.e. chasing our kids) and that tasted like everything that makes a Butterfinger so gosh darn amazing. And of course it had to be an easy entertaining dessert that I could make way ahead of time… before the play date chaos begins. 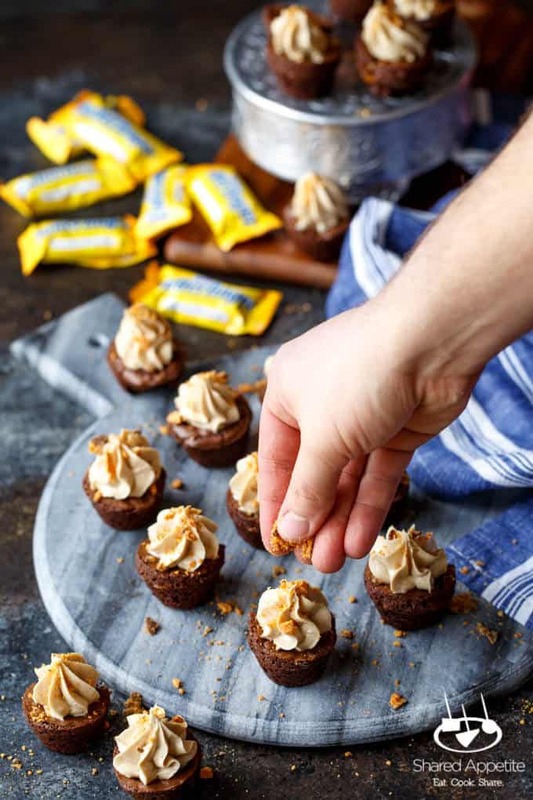 Let’s break these Butterfinger Cheesecake Brownie Bites down. It all starts with your favorite brownie mix, to which we’ll add some crushed up Butterfingers. That’ll give some some wonderful crunch to the fudgy brownie bites. Next comes the no bake peanut butter cheesecake topping. It’s as easy as whipping together four staple ingredients… cream cheese, peanut butter, powdered sugar, and whipped topping. You know, all the good stuff in life. 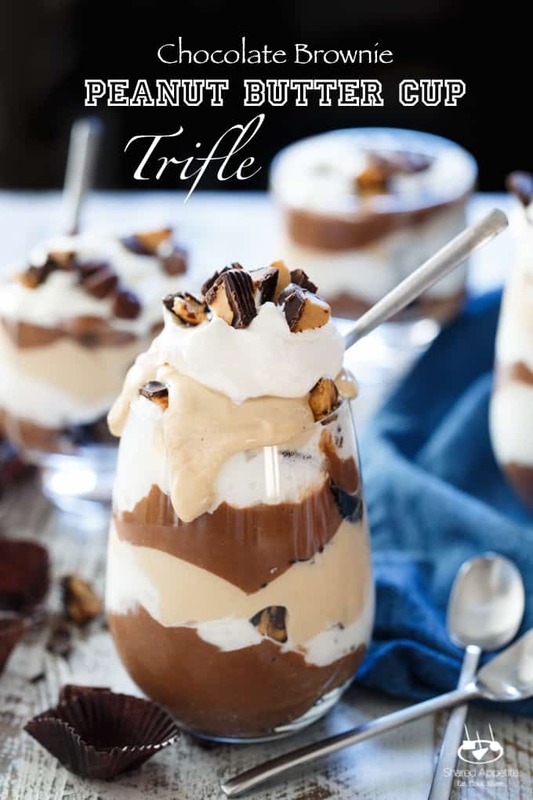 Top it off with some crushed up crunchy Butterfinger and boom… that’s one heck of a dessert. Preheat oven to 350°F. 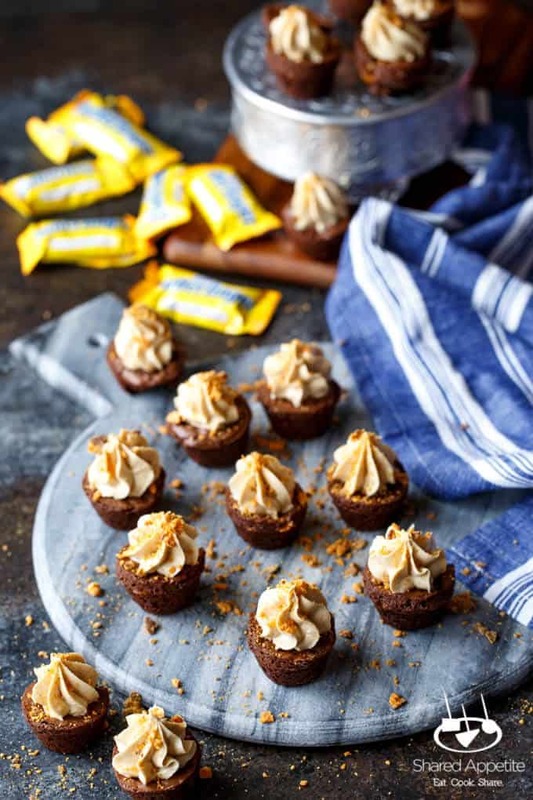 Stir in 4 of the crushed Butterfinger fun size candy bars into prepared brownie batter. Grease a mini muffin pan* with nonstick cooking spray (or line with mini muffin cups. Fill each muffin cup 3/4 of the way and bake for 18-20 minutes, until brownies are just cooked through. Remove from oven and let cool for at least 10 minutes in the muffin pan before removing brownie bites to a cooling rack. Meanwhile, in a large mixing bowl, beat together cream cheese, peanut butter, and powdered sugar until smooth and fully incorporated. Add cool whip and beat until light and fluffy, scraping down the sides as necessary. Refrigerate for at least one hour. 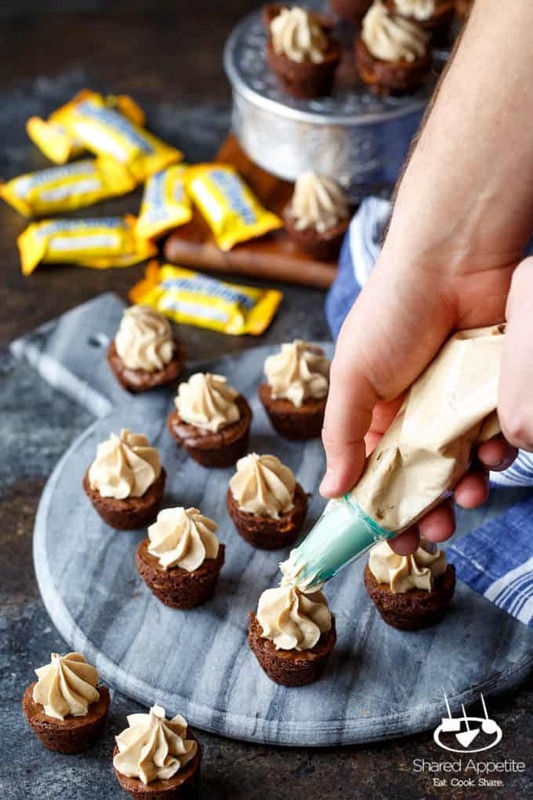 When ready to serve, pipe peanut butter cheesecake filling onto cooled mini brownie bites using a pastry bag fitted with a wide star tip. 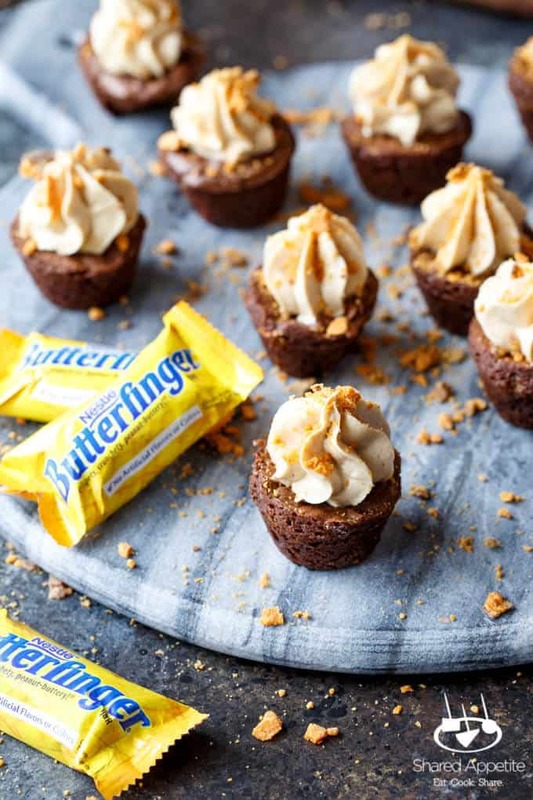 Garnish each mini cheesecake with remaining crushed Butterfinger. 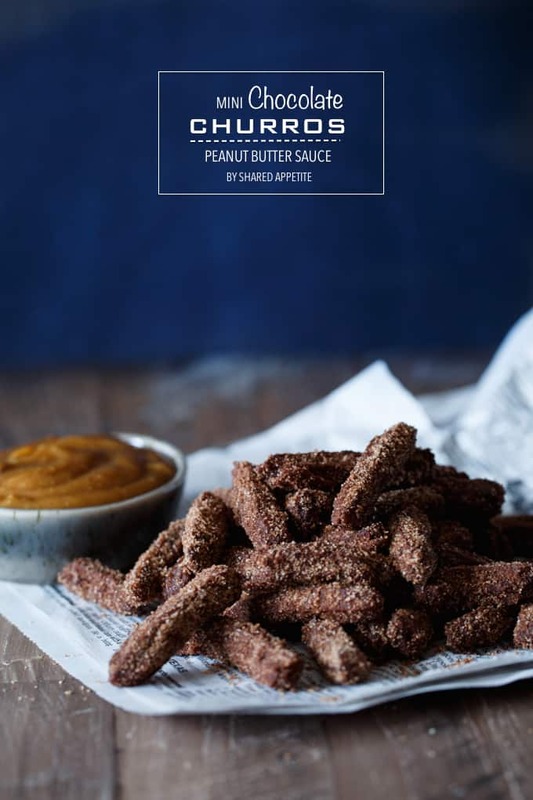 Need Some More Chocolate Peanut Butter? Haha yes, sweet nectar of life! You’ve combined two of my favorite desserts ever. Plus a candy bar?? Yesssss.